14,000 companies use our professional solutions worldwide. Starting from $588 per year! Boost Your Efficiency. Why Our Customers Love Us. 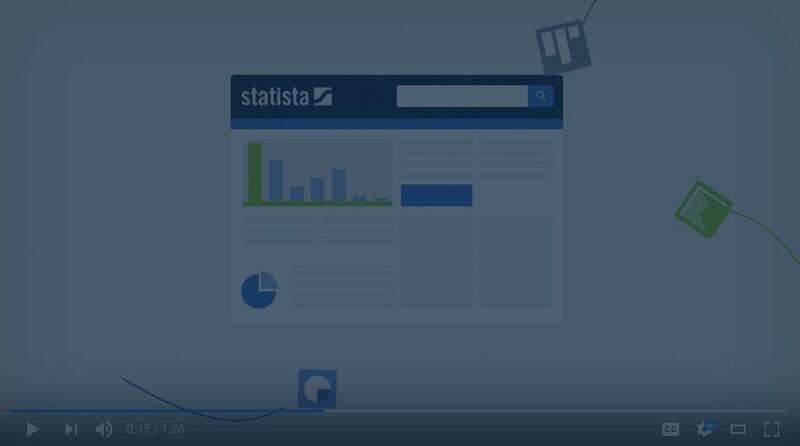 Statistics, market forecasts and surveys: We will be happy to provide you with individual advice on how Statista can drive your business. Get instant access to over 1m facts and download rights to data in XLS, PDF & PNG format. Available from $49 per month. This statistic shows the tourist attendance of Parisian cultural sites in 2017, in thousands of visitors. It appears that Notre-Dame de Paris attracted more than 12 million visitors, while the Sacré Coeur recorded around 10 million visitors. This statistic shows the planned Easter shopping location of consumers in the United States in 2018. In 2018, 58.9 percent of respondents stated that they planned to visit discount stores for their Easter shopping needs. This statistic displays consumers' planned Easter spending in the United States from 2017 to 2019. In 2019, U.S. consumers planned to spend approximately 18.11 billion U.S. dollars to celebrate Easter. This statistic presents the Easter church attendance figures for the Church of England from 2010 to 2017. During this time period the number of Easter church attendees has declined from 1.4 million in 2010 to 1.25 million by 2017. During a similar time period the size of the congregation at Christmas has increased, reaching approximately 2.68 million attendees in 2017. This statistic shows the production volume of chocolate Easter bunnies in Germany for Easter 2019. That year, a total of 220 million Easter bunnies were produced in Germany. This statistic displays the omnichannel customer experience score of leading retailers in Europe in 2018. According to data, Bever, an outdoor equipment retailer from the Netherlands, ranked highest with an omnichannel customer experience score of 69. Magasin Kiabi (France), Schuh (Germany), NetonNet (Sweden) and House of Fraser (UK) together shared a score of 67 in the omnichannel customer experience review in 2018. In March 2019, LeBron James passed Michael Jordan on the NBA all-time scoring list, scoring his 32,293rd point in a regular season game against the Denver Nuggets. James currently ranks fourth on the list and If he continues to produce at about his career average, he will pass Kobe Bryant at some point during the 2019/20 season for third place on the list. He has a shot to move up even further and pass Karl Malone with about two more full seasons of games, and even catch Kareem Abdul-Jabbar, the NBA’s current all-time leading scorer, while on his current contract with the Los Angeles Lakers which runs through the 2021/22 season. 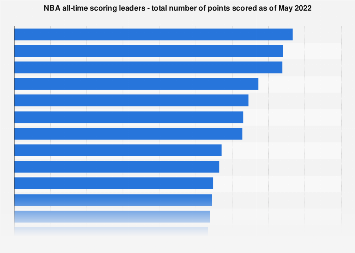 LeBron James already leader in playoff scoring The statistic shows only the points scored in regular season NBA games and does not take into account production in the playoffs. When looking at playoff scoring by itself, LeBron James is the all-time leading scorer in the NBA already, with 6,911 points. He is also the only player with more than 10,000 minutes played in playoff games, in large part thanks to his impressive streak of 14 consecutive playoff appearances (2004/05-2017/18) and a streak of eight straight NBA finals appearances (2010/11-2017/18). He is also the career leader for the Cleveland Cavaliers, for which he played a total of 11 seasons, in many important statistical categories like points, assists, rebounds, steals, and games played. The exclusive 30,0000 club – next member Kevin Durant? In the history of the NBA, only seven players have scored more than 30,000 points. LeBron James is the only member of this group still playing in the NBA. Of all the players active in the league right now, Kevin Durant has the best chance to join that group at some point. The 30-year-old currently plays for the Golden State Warriors and needs about 7,000 points to reach the 30K mark – about four more full seasons of work. Footballer Cristiano Ronaldo heads the ranking of the most popular Instagram accounts. He is the most-followed person on the photo sharing app platform with more than 160 million followers. 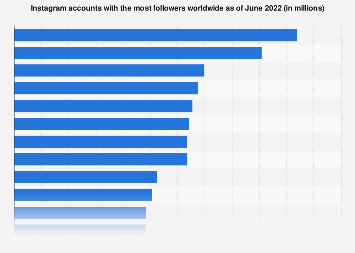 Instagram's own account was ranked first with almost 291 million followers. Instagram is a photo-sharing social networking service that enables users to take pictures and edit them with filters. The platform allows users to post and share their images online and directly with their friends and followers on the social network. As of June 2018, the cross-platform app reported more than 1 billion monthly active users. Currently, there are almost 105 million Instagram users in the United States and experts project this figure to surpass 130 million users in 2022. Instagram audiences are predominantly young – recent U.S. data states that half of Instagram users are aged 34 years or younger. Spring 2018 data reveals that Instagram is also one of the second-most important social networks of teenage internet users and one of the most-visited social networks among teenagers in the United States. Brands are keen to reach Instagram audiences as users of the social network show high engagement rates with the displayed content. Sports content such as NBA and NFL, as well as sporting sites Bleacher Report and Barstool sports have highly engaged audiences on the platform and it is not uncommon for athletes to generate additional income with social media advertising. Unsurprisingly, Ronaldo ranks first again, as the average media value of one of his Instagram posts is 735,386 U.S. dollars. The statistics ranks the teams of the National Football League by the number of Super Bowl titles won from 1967 to 2019. The New England Patriots have won the Super Bowl six times, most recently Super Bowl LIII in February 2019. More Super Bowl statisticsAdditional information on the Super Bowl The Super Bowl is the annual championship game of the National Football League (NFL), pitting the champions of the NFL’s two conferences (AFC and NFC) against each other. The games were originally created as part of a merger agreement between the American Football League (AFL) and the National Football League, with the first Super Bowl being played on January 15, 1967, following the 1966 football season. To identify the games, successive Roman numerals are used leading up to the most recent Super Bowl in 2014 (Super Bowl XLVIII). With six championships wins each, the Pittsburgh Steelers and the New England Patriots are the most successful NFL franchises in terms of Super Bows won, as shown in the graph above. The New England Patriots are the most recent champions, defeating the Los Angeles Rams in Super Bowl LIII with a score of 13-3. Winning Super Bowl LII made Tom Brady the player with the most Super Bowl rings as players with a record setting sixth Super Bowl win. Charles Haley, who played from 1986 to 1999, has the second-most Super Bowl rings with five. Notable players who have won four Super Bowl rings are Joe Montana, Bill Romanowski, Adam Vinatieri, Ronnie Lott, Matt Millen and Terry Bradshaw. The statistic presents the most-played PC games on the online gaming platform Raptr in November 2015, by share of total time played. According to Raptr's blog, 4.82 percent of all time spent gaming on their platform in November 2015 was dedicated to playing World of Warcraft. In the fourth quarter of 2014, World of Warcraft gained more than 10 million subscribers, mostly owing to 'Warlords of Draenor' expansion release in November 2014. Data shows that WoW was also the second best selling PC game worldwide as of January 2017. With a market value of 926.9 billion U.S. dollars, Apple led the ranking of the world’s largest companies in 2018. Some of the most recognizable companies in the world, Amazon, Alphabet (Google), Microsoft, and Facebook followed closely behind, rounding out the top five. Apple also led the way in 2017 as the world's most profitable company, with a net income of 48.35 billion U.S. dollars. Determining value Market value and market capitalization are two terms frequently heard when discussing the profitability and viability of companies. Put simply, market capitalization, or market cap, is the worth of a company based on stock price; an important metric when determining value for potential trading opportunities. Market value, however, is what a company is worth in a much broader context and can change greatly depending on the business cycle. It is determined by multiple factors, including stockholder equity, corporate debt, and the market environment as a whole. The world’s top companies In fiscal year 2017, Apple’s global revenue stood at 265.6 billion U.S. dollars, but somewhat surprisingly, did not manage to crack the top ten of companies with the largest revenue. The American multinational retailer Walmart led the way as the largest company in the world when considering revenue and employment. Founded in 2004, Facebook is currently the biggest social networking service based on global reach and total active users. Launched by Harvard student Mark Zuckerberg and some of his contemporaries, the service was initially only available to Harvard students but soon expanded to regional universities, the Ivy League and further universities before opening up to high school students and global users aged 13 or over. As of October 2018, India, the United States and Indonesia rank first in terms of Facebook user base. Facebook users must register before using the social network and are free to create a personal profile in order to interact with other users which they can add as friends. Furthermore, Facebook users may join user groups based on workplace, college or school and can also categorize their Facebook contacts into lists. Users can post status updates or other content and message each other. Facebook users can also interact with a wide selection of applications including social games or other services like the photo-sharing app Instagram. In September 2012, Facebook announced over one billion active users across all platforms. The social network is also accessible to mobile web users and has published a series of apps based on original Facebook features such as Facebook Messenger, which had 1.3 billion monthly active users as of September 2017. This statistic shows the estimated number of subscribers of the MMORPG World of Warcraft online game from 2015 to 2016, with a forecast until 2023. In 2015, when Activision Blizzard last reported on WoW's subscriptions, the game had 5.5 million global subscribers. It is projected that the numbers will be gradually decreasing to reach 4.46 million in 2023. World of Warcraft subscribers – additional information World of Warcraft reached the peak of its popularity in the second half of 2010, when Activision Blizzard’s estimates put the global number of WoW subscribers at 12 million. Before that, the number had been climbing steadily from 1.5 million in the first quarter of 2005, exceeding five million in the fourth quarter of 2006 and 10 million in the fourth quarter of 2007. In 2011, the figures started falling and by the first quarter of 2014, they decreased to the 2006 level. World of Warcraft is the fourth in the series of games published by Blizzard Entertainment, after “Orcs & Humans,” “Tides of Darkness,” and “The Frozen Throne.” It was released in late November 2004; the date was not arbitrary – the release celebrated the 10th anniversary of the whole franchise. As of August 2016, six expansions to the game had been released, with the fifth – “Warlords of Draenor” – having appeared on the market in fall 2014. Within the first day of its release, the expansion pack sold 3.3 million copies, as did the sixth expansion - Legion. The main appeal of the series is the possibility for players to transform into many different creatures, so called races, yet most choose to be human. In 2012, WoW publisher Activision Blizzard was the most successful video games publisher in Europe and the United States, holding nearly 20 percent of the market. The company’s 2013 annual revenue amounted to 4.48 billion U.S. dollars, out of which more than one billion constitutes the company’s net income. The company has also created such games as Call of Duty, Guitar Hero, and StarCraft. This statistic provides information on the most popular networks worldwide as of January 2019, ranked by number of active accounts. Market leader Facebook was the first social network to surpass 1 billion registered accounts and currently sits at 2.27 billion monthly active users. Sixth-ranked photo-sharing app Instagram had 1 billion monthly active accounts. Social networks The leading social networks are usually available in multiple languages and enable users to connect with friends or people across geographical, political or economic borders. Approximately 2 billion internet users are using social networks and these figures are still expected to grow as mobile device usage and mobile social networks increasingly gain traction. The most popular social networks usually display a high number of user accounts or strong user engagement. For example, market leader Facebook was the first social network to surpass 1 billion monthly active users, whereas recent newcomer Pinterest was the fastest independently launched site to reach 10 million unique monthly visitors. The majority of social networks with more than 100 million users originated in the United States, but European services like VK or Chinese social networks Qzone and Renren have also garnered mainstream appeal in their areas due to local context and content. Social network usage by consumers is highly diverse: platforms such as Facebook or Google+ are highly focused on exchanges between friends and family and are constantly pushing interaction through features like photo or status sharing and social games. Other social networks like Tumblr or Twitter are all about rapid communication and are aptly termed microblogs. Some social networks focus on community; others highlight and display user-generated content. Due to a constant presence in the lives of their users, social networks have a decidedly strong social impact. The blurring between offline and virtual life as well as the concept of digital identity and online social interactions are some of the aspects that have emerged in recent discussions. The statistic depicts the so-called Big Mac index in 2019. The index is regarded as an indicator for the purchasing power of an economy. The average price for a Big Mac burger in Switzerland was 6.62 U.S. dollars in January 2019.Big Mac Index The Bic Mac index has been published annually by The Economist since 1986 and is rated as a simplified indicator of a country’s individual purchasing power. As many countries have different currencies, the standardized Big Mac prices are calculated by converting the average national Big Mac prices with the latest exchange rate to U.S. dollars. The Big Mac, as a top-selling McDonald’s burger, is used for comparison because it is available in almost every country and manufactured in a standardized size, composition and quality. McDonald’s is a worldwide operating fast food restaurant chain with headquarters in Oak Brook, Illinois. Its global revenue amounted to about 21.03 billion U.S. dollars in 2018. Most McDonald restaurants are spread across the United States. This graph displays the number of murders in the United States by state. Data includes murder and nonnegligent manslaughter. In 2017, the number of murders in California amounted to 1,830 victims. Murder in the United States Violent crime statistics, particularly murder and homicide data, provide key insights into law enforcement in the United States and inform national debate surrounding crime policies. There were a total of 17,284 reported murder and non-negligent manslaughter cases in the U.S. in 2017. Although the number of cases has declined in the past twenty years, when viewed in international comparison, the U.S. murder rate is still high. In 2012, Germany’s murder rate stood at 0.8, compared to 4.7 in the United States. The most dangerous U.S. state in 2017, if measured by the number of murders per hundred thousand inhabitants, was Louisiana. The murder and non-negligent manslaughter rate in Louisiana came to 12.4 that year, more than twice the national average. The least dangerous state in 2017, on the other hand, was New Hampshire, with a murder rate of 1. Murder, homicide and violent crime statistics regularly influence America’s current political debate on gun law. Under the Second Amendment, U.S. citizens are entitled to own and carry firearms, though gun control and regulation laws are hotly contested. The amount of firearms in circulation in the U.S. is fairly high, when compared with European countries. About 39 percent of American households have a gun in their home. Though any causal connection between firearm circulation and homicide rate is purely speculative, murder by firearm is nonetheless high. About 73 percent of murders and non-negligent manslaughter cases in the U.S. were carried out using a firearm, including handguns, rifles, and shotguns. This number sums up to 11,004murders by firearm. The ranking of the most dangerous cities in the world based on murder rate per capita can be accessed here. Subscribe to our newsletter for your daily dose of infographics. Stay up to date with your daily dose of infographics on media, economy, society and sports. The quality of our data is ensured by multilevel review processes, competence and experience. With over 22,500 trustful sources, we ensure to have the highest quality data.